With millions of acres of public land, Colorado is a spectacular playground for adventure enthusiasts. Natural beauty is on display almost anywhere you look. You can play on land or water, in the mountains and the forests, across the plains and rivers, any season of the year. 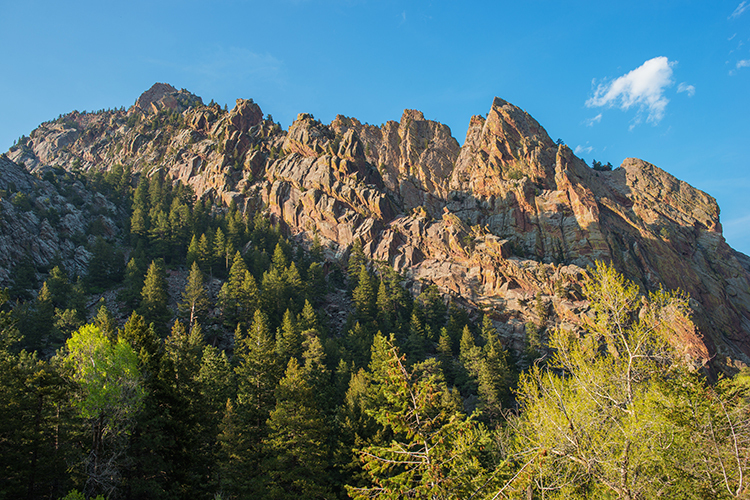 Next time you're in the mood to get outdoors, check out the best state parks in Colorado. Water people, grab your bathing suits and head for this 3,400 acre reservoir. At 8,600 feet, you might also need to pack along a wetsuit. Kayaking, canoeing, sailing and windsurfing get you out on the water, and with strong winds and high waves, you’re in for the ride of your life. Fishermen will meet their match trying to reel in some of the largest rainbow, brown and cutthroat trout in the state, plus northern pike. Amenities include a visitor center, boat ramps, campsites with hookups and marina. Five miles of scenic trails for the hiker and biker in the group. Wild to mild. That’s how the Arkansas River is tagged. As the most commercially rafted river in the country, it is a whitewater rafter’s nirvana. The more than 150 miles of river are also an angler's paradise, full of brown and rainbow trout. Panning for gold, rock climbing up the walled canyons, hiking, biking, horseback riding, motorized OHV trails and both group and individual campsites, plus winter activities like ice fishing and snowshoeing make this Rec Area a year-round outdoor destination. Did you know you can sail in Colorado? Well, you can here on this huge lake that has 150 miles of shoreline. You can also cruise the lake in a houseboat, motorboat, canoe, kayak, jet ski or paddleboard. Fishing—and catching—is abundant. Northern pike, trout, bluegill, catfish and crappie are worth dropping a line for. Lots of different way to spend the night from primitive camping to full-service hookups to staying in a log cabin. Great wildlife viewing areas for deer, elk, bald eagles and migrating birds. Not one, but three parks connect to make this area a bonanza of fun. The Park’s headquarters has camping, a visitor center and nature trail. The Yampa River has 13 access points, gateways to incomparable fishing, Class I to V river boating and more camp sites. The Elkhead Reservoir is the place for swimming, boating, picnicking, more fishing and camping, plus a trail for hikers, mountain bikers and horseback riders. A triple-threat of outdoor enjoyment. If you lived in Boulder, this area is so accessible it’s just like having a park in your backyard. Rock climbers flock to its preeminent cliffs, scrabbling up the more than 500 technical routes. For those who like to stay grounded, there are trails for hiking and mountain biking. It’s a day-use only park, perfect for packing a picnic basket, a camera and a sturdy pair of boots for a day of exploration. No overnight stays. Winter brings with it cross-country skiing and snowshoeing. Lory rhymes with glory and this park is full of it. Glorious scenery abounds throughout the 2,500 acres. And you can see it on a bike, horse or just by walking, or running, on any of the 26 miles of trails that wind through forests, across meadows, along streams and up and out of granite-walled arroyos. Primitive and backcountry camping only. Access to Horsetooth Reservoir adds water activities to any outing. A triple waterfall, 70-feet of crashing water, is the centerpiece of this spectacular park. Get too close and you will get wet from the mist and spray. For the spelunkers, there are limestone caves, one with a 90-foot ceiling. Hiking trails take you to the top of the falls and skirt East Rifle Creek. Sit on the bank for some good trout fishing. Campsites are limited; reservations are recommended. If by chance you’re looking for a wedding venue, you couldn’t find a more beautiful spot than the Mountain Mist Amphitheater. Surrounded by the White River National Forest, this park is defined by its name—a pastoral, pleasantly bucolic, wooded spot. Fish for rainbow, cutthroat, brook and brown trout. Hike the park trails, watchful for wildlife and mountain birds. In the summer months, get out on the lake in a canoe, kayak, paddle boat or electric motor boat. Spend a night or weekend at the campground or, for a change of pace, in a cabin or yurt. Experience the prairie here, much like the pioneers who came across these high plains on the Overland Trail did. The grasslands stretch for miles. You might even catch a glimpse of a pronghorn mule deer, or any one of the 200 plus migratory birds that stop by throughout the year. There’s a reservoir for boating, fishing and swimming. Campgrounds are extensive, more than 140 sites, many will full hookups. All have showers, restrooms and laundry facilities. Hunting is permitted only by bow or shotgun with bird shot. Plan to stay here for a while because it’s a great jumping off point for a bucketload of outdoor adventures. Nestled in the forest of the San Juan Mountains near the pristine water of the Jackson Gulch Reservoir, there is plenty to do year-round. Explore on foot, bike or horseback on a network of trails that eventually connect to the Colorado Trail. Canoe, kayak or fish for yellow perch or rainbow trout at the lake. It’s near some must-see sites—Mesa Verde National Park, Anasazi Heritage Center and the Durango-Silverton Narrow Gauge Railroad. Campgrounds have water and vault toilets; no hookups. Tent sites are primitive. But the two yurts are heated and comfortable.